Real estate experts love to tell property owners how important it is to redo their kitchens and bathrooms. Easy for them to say – they don’t have to foot the bill for the expensive renovations! But they’re not wrong, either. Kitchens and bathrooms are extremely important to buyers and renters, and it makes sense from a psychological standpoint. People literally have an visceral connection to kitchens and bathrooms; these are places where they prepare and eat food, and where they groom and clean themselves. Naked. That means they will either be attracted or repulsed by your property’s kitchens and bathrooms, on a deep level. So you have a rental property (or home) with an ugly, dated kitchen or bathroom, but you don’t have $5,000 sitting idly by and twiddling its thumbs. What’s a landlord or homeowner to do? Here are seven ideas to take your rental’s kitchen and bathroom from woebegone to warm and inviting, on a tiny budget. Sure, you could install brand new marble tiles. Right after parking your private yacht and hopping into your Maserati. If your kitchen or bathroom tiles look like the ‘70s had an avocado and mustard party, why not just cover most of it up? For the bathroom, get a thick, plush bathroom rug, in a complementary color (or white – you can never go wrong with white). In the kitchen, get a throw rug in attractive colors that match the existing scheme. Just make sure the rug covers most of the floor space, and deemphasizes whatever’s left peeking out. Along similar lines, kitchen counters can be extremely expensive to replace. But not so expensive to cover and deemphasize. Lucky for you, you have a veritable plethora of options. First, consider installing butcher block counters. If the word “install” doesn’t sit well with your budget or skill set, then just buy a butcher’s block with the right dimensions and sit it on top of your existing counters. Problem solved. If even that is too much for you, then just buy a big ol’ cutting board that takes up plenty of counter space. You can round out your counter space with a wooden or bamboo dish rack, and a matching (or similarly-colored) wine rack. Bonus tip: throw a couple cheap (but expensive-looking) bottles of wine in the rack. It reinforces the vibe, and once again distracts from the room’s shortcomings. If you don’t like any of that, just do like the Rolling Stones and paint it black. Sand the counters down, use heavy primer designed for plastic, and use glossy oil-based paint. If you’re inspired, top it all off with a layer of satin poly. Noticing a theme here? Coat over those old, gnarly-looking cabinets with a few layers of primer and paint. You don’t have to paint them white… but if you paint them bubble gum pink, the result is on you. If you’re artistically inclined, you can always paint accents or stencil simple designs onto the white cabinets. While you’re at it, add new drawer liners if the inside of the drawers are looking grungy. You’d be amazed what wonders new hardware can work on old cabinets. Pick a style and rock it out. Stark, clean modern lines? Rustic farmhouse chic? Maybe kitschy, with a beachy shore theme? Just make sure it’s consistent, and complements the feel of the rest of the kitchen. This trick works for any kitchen or bathroom, and you can install them yourself with nothing more than a screw gun. Or you can buy a few cases of beer and bribe your handy friend to do it with you. Don’t forget the faucet, which is a centerpiece fixture in any kitchen or bathroom. The only limitation here is that it shouldn’t clash with the rest of your hardware and the general feel of the room. But go upscale with your faucet to add some pizzazz to the room, and distract prospective renters from the not-so-fancy floor. And cabinets. And appliances. Desperate college kids have a saying – beauty’s only a light switch away. Who’d have thought it holds true in kitchen renovations? Light switch plates and outlet covers are another hardware element you can swap out with fancier replacements, without much cost or labor. Actually, all you need is a screwdriver and you’re all set. Remember to keep them consistent with the look in the rest of the room (are we sounding like a broken record yet? ), so that the new look is cohesive instead of a clashing nightmare. By this point, the room should be developing a visual theme, and making middle-aged women swoon that “It’s so cute!” Little do they know that you financed the whole thing with a jar of coins. Bonus tip: consider installing dimmer switches in the living room. It’s a selling point that you can croon about in the rental listing. Does the room look dingy because the lighting’s too dim? Too bright? Too warm? Too cold? Like we said in the beginning, you could blow thousands of dollars getting the chi of the room just right with marble floors and counters… or you could spend $1.99 on the right light bulbs. As a general rule, you want warmer color temperature bulbs in the kitchen, and cooler color temperature bulbs in the bathrooms, but that’s not a commandment written on a stone tablet. Do what looks best and makes the most sense for your room. If you went heavy on the wood look in the kitchen, with butcher’s blocks and wooden dish racks and whatnot, consider those retro, faux-industrial incandescent bulbs that are so trendy in hipster restaurants. It’ll reinforce that ambiguously rustic-yet-industrial chic look. And then there’s the light fixtures. Keep ‘em classy, and, of course, keep the look consistent. It is positively, absolutely, monumentally important that your rental unit is sparkling clean when you show it. And nowhere is that more critical than in the kitchen and bathrooms. Remember, people have a visceral connection with kitchens and bathrooms, in the most literal of senses. No one wants to imagine themselves cooking in a kitchen that’s layered in dirt and dust, or showering in a bathroom oozing with mold and grime. If you drop a piece of food on the floor of these rooms, those floors better be so clean that you wouldn’t think twice about eating off of them. With a little imagination, some elbow grease and a full bottle of bleach, you don’t need much money to transform your rental property’s kitchen and bathrooms. Don’t be afraid to call in your friend with impeccable taste, or your friend who’s super handy and loves a good project. Pay them with beer, wine, food and good humor, and make sure the rooms look cohesive and sparkling clean before showing the vacant unit to prospective tenants. 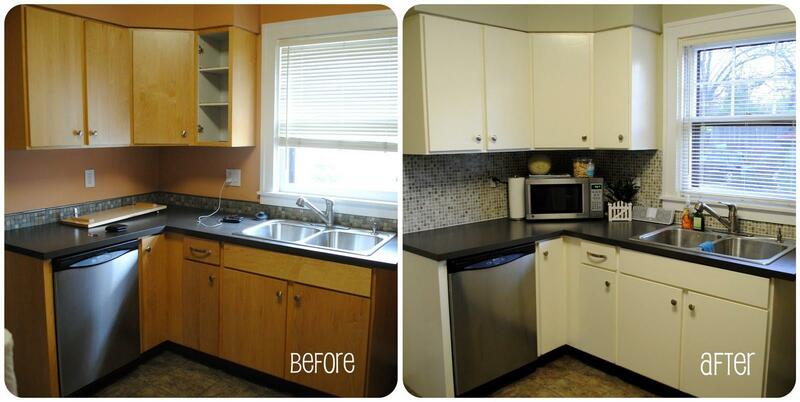 What tricks have you used to inexpensively redo your kitchen or bathrooms? Have any shortcuts to share? You guys always come up with the most creative ideas for cheap property upgrades! I love it. Thanks Chelsea! We try. I heard once that the more creative you are, the less money you need. I’d rather like to think it’s true! When I think about how much money I blew on my last kitchen renovation in a rental property, it makes me cringe. Well into the four digits. Going to try a few of these ideas for another property of mine the next time it’s vacant. Will keep you posted! I hear that. I’ve blown plenty of unnecessary money on rental property upgrades over the years, much of which did not come back. All about ROI and making more out of less! Fantastic ideas! I’m in the middle of a kitchen and bath reno on a rental that has a lot of potential, it just need some updating. These ideas are perfect (already updating all outlets and switches with inexpensive, but clean and crisp classic white ones). I especially love the rug suggestion. Another idea is to update the light fixtures. You’d be surprised by how many inexpensive, yet classic-looking light fixtures are available, not only from the big home-improvement stores, but also from even less expensive places like Walmart. They look great and work great, but cost a lot less. And they’re not that hard to install, either by yourself (YouTube) or with the help of that handy friend. Thanks for the article. I’d love to see more like this. Thanks Laura! I completely agree, no need to spend an arm and a leg just to give the kitchen a fresh look. And you’re spot on about the light fixtures! I understand not wanting to break the bank on a rental, but in the end, it is still your property. Making wise upgrades only increases the value of your asset and can also save you money down the road. I would rather spend a little more on a more durable finish floor than to replace it every 2 years because it gets trashed. The same with countertops and cabinets. MDF or particle board should never be used in a rental. The same goes for wire shelving, not only do you have to replace the shelf, but you will also often time have to patch the drywall as well. All headaches that can be avoided by spending a little more. Then 10 years down the line and you decide to sell the place, it will still be in decent shape. Just my thoughts. I agree you don’t want to put cheap, fragile fixtures in your rental property. If you don’t have a large budget, then it’s better to work with the fixtures you already have and give them a new look, rather than replace them with something inferior. A new look doesn’t require replacements, just a creative vision! We’ve reviewed several landlord lenders and fix-n-flip lenders, and compared their terms in a simple table. Denise Supplee is a landlord and former property manager, with over a decade's experience in legal forms for landlords and property managers. She's also a champion mom and licensed realtor. Brian Davis is a landlord and real estate investor with 15 rental properties. Husband, rental industry expert and compulsive traveler, Brian visited ten countries last year. Our goal in building Spark Rental? To help other landlords & property managers automate their rentals like we've done, so they can spend more time with the people and passions they love. Run a FREE SSN trace & identity check! Credit, criminal, eviction reports also available from $9/report. Want to create passive income? to help you start earning income from rentals. 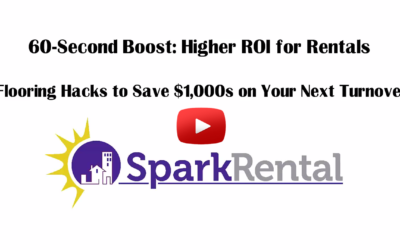 Want to earn more from your rentals? Download our free Ultimate Guide to Higher ROI and be dazzled by the charming wit, disarming frogs and invaluable tips for higher profits and less work. Ready to build passive income from small multifamily properties? Over the next week, we'll email you a free series of videos, so enter your best email and let's get started! NEW free masterclass! Join us live for a clear-eyed look at what it takes to retire in 5 years on rental income. Your seat is reserved! Check your email to confirm. We'll email you the "recipe," plus a free mini-course on passive income over the next week, so enter your best email! P.S. We never share your email, ever. It's on! Check your email to confirm.